It isn't often that a true story mixes race and class in a Jane Austenesque setting, but Belle manages to tell a fascinating, if somewhat dry, story lifted up by a career-making performance that hopefully will lead to greater roles for its star, Gugu Mbatha-Raw. Belle is both a period piece and a strong study on the issues of race, gender, and social status: all of which are still with us today. If one wants to see Belle as a straight costume picture, fine. If one wants to see Belle as a commentary on today's times, fine. If one wants to see Belle as a biographical film about an obscure but fascinating figure from history, that's fine too. The important thing is to see Belle, period. Dido Elizabeth Belle (Mbatha-Raw) is a curious situation. As the daughter of a black woman she is a slave, but she is also the daughter of a British naval officer, Captain Sir John Lindsay (Matthew Goode). As a result of this, Captain Lindsay takes his child and brings her to his uncle, Lord Mansfield (Tom Wilkinson) and Lady Mansfield (Emily Watson). They aren't necessarily thrilled to see a "Negress" as family, but family she is. Dido's presence has a benefit: she can serve as companion to their other niece, Elizabeth (Sarah Gadon), and the two girls grow up together as the bestest of friends, almost sisters where race is unimportant. As they grow into women now they are expected to enter society, or at least one is. Being both illegitimate and black makes Dido's coming-out problematic. However, unlike her cousin Elizabeth Dido has an advantage. Her father has left her a wealthy heiress, one who does not need to find a man to keep her in the manner she's grown accustomed to (even if that manner prevents her from dining with the family when company comes), so while her prospects are dim, Dido at least can live without worrying about money. This is not Elizabeth's fate, who undergoes her own version of a slave auction as she is paraded among eligible men of her station. This situation makes this a bit dicey for the ambitious Ashford family. The venal Lady Ashford (Miranda Richardson) doesn't want a mulatto in the family, but she does want connections to the Mansfield clan. She pushes her younger son James (Tom Felton) towards Elizabeth, and Elizabeth looks pleased with this match. Lady Ashford on the other hand, discourages the sincere efforts of her older son Oliver (James Norton) towards Dido, whom he is attracted to (much to the disgust of both Lady Ashford and James). Imagine their mutual horror upon learning that Elizabeth is virtually penniless and Dido is a wealthy heiress! Suddenly, Lady Ashford doesn't dislike Dido as much as she did, but Dido, who genuinely has feelings for Oliver, finds that the Ashfords are not suitable for her. James, for his part, is coarse with Dido, and there is a brief rupture in Dido and Elizabeth's friendship over their marriage situations and prospects. However, when James opts for a wealthier choice, a distraught Elizabeth turns to Dido for comfort and their wounds are mended. As Dido and Elizabeth continue to seek out love and marriage, Lord Mansfield is consumed by the Zong case. As Lord Chief Justice, Mansfield has to decide the case of the ship Zong, which hinges on whether the black 'cargo' was justifiably dumped by the ship or whether the 'cargo' was deliberately murdered. It would chip away at the institution of slavery in the British Empire, if not bring a legal precedent to abolishing it altogether. To help Lord Mansfield, he has a young clerk, the vicar's son John Davinier (Sam Reid). Davinier is a passionate young man, eager to rise and to destroy what he sees as the evil of slavery. He also becomes fond of Dido, who at first does not return his affections. They are after all, from different classes, and at the moment that distinction is more important than being of different races. As Dido learns more about the Zong case, she and John begin seeing each other in secret. Dido goes as far as to provide evidence that makes it clear that the ship's captain did not throw the slaves out to open sea to preserve their water supply (as he contends) because they had passed several ports where they could have refueled. They were dumped because they had become diseased and thus, unsellable. As time goes in the case, John and Dido do fall in love, and Lord Mansfield is highly displeased in his niece's prospects of marrying beneath her class. A VICAR'S SON! A LOWLY LAW CLERK! However, true love will not be denied, and neither will justice. Elizabeth too finds love with a better suitor who is both rich and cares for her, and we learn that she and John had a happy marriage. The interesting thing about Belle is that it is both based on a true story and a brilliant commentary on the issues of race, gender, and class. Dido is held back because of her heritage, but at the same time she is liberated because of her class and financial standing. She is both slave and free: legally she could be sent into the fields but her unique circumstances allowed her to not be under the 'protection' of a man. Her cousin-sister Elizabeth conversely is legally free but dependent on the kindness of a wealthy man. Both women, in their own way, were captives, and if it were not for the twists of fate (say, if Dido had been white or Elizabeth had been wealthy) they would have been in thoroughly different circumstances. "We are but their property," Elizabeth observes to Dido. For her cousin, that term has so many different meanings, but all of the interpretations are true. Also, when race doesn't come into play, then the issue of gender arises. Apart from the parading of the women to 'land a man', there is also the dual idea of what Dido's role could be. Lord Mansfield provided education for his nieces, but he also considered them too intellectually weak to understand the nuances of the Zong case. Would Dido turn into the old maid of the family because her marriage prospects were hampered by her race? She had that burden, but she also was a woman of independent means, so in this respect she was free. If race or gender doesn't come into play, then the issue of class does. Lord Mansfield's objections are not from it being a mixed-race marriage, but it being the marriage of a lower-class man to his aristocratic niece. Despite being black Dido has grown up with wealth and is for all intents and purposes a refined lady of high position. Therefore, her union with a vicar's son is not seen as a suitable prospect for her, love be damned. Belle in short tells both a fascinating life story and reveals so much about the issues that divide people: race, gender, class...all the biggies. Belle also has a dynamic performance from Mbatha-Raw as the title character. At one point Dido, fully aware of being excluded by the family that does love her but still bows to social conventions, begins to paw at her skin, as if attempting to tear the blackness from her. Mbatha-Raw blends so beautifully into her surroundings, be it the slums of the docks as she helps and meets with Davanier or walking in refined aristocratic homes. By 'blending in' I mean to say Mbatha-Raw makes Dido appear to be born to a world of privilege while still understanding that she is not a full member of that world. Her evolution into doing things for herself (finding more about the Zong case, following her heart) is a beautiful thing to see. I would say Mbatha-Raw is what pulls one into the movie, seeing her rise above the sometimes dry, Masterpiece Theater-type script with its costumes and love story. She is an actress on the rise, and I hope that this will be her breakout film in the same way 12 Years a Slave was the breakout for another talented and beautiful actress (Lupita Nyong'o). She was supported by a reliable cast who might have had a one-note character (the besotted Reid, the bitchy Richardson) but who knew the parts and played them well. 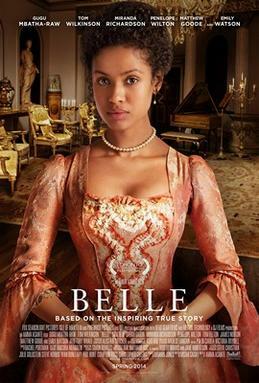 At times I will say Belle is a bit dry and standard in terms of a costume picture, but the wit of the story (and with a steady directing hand of Amma Asante), Belle is entertaining and informative, if a bit stately. In short Belle is both an entertaining biopic of a little-known but fascinating life and a sharp commentary of the divisions that people place on each other and themselves. 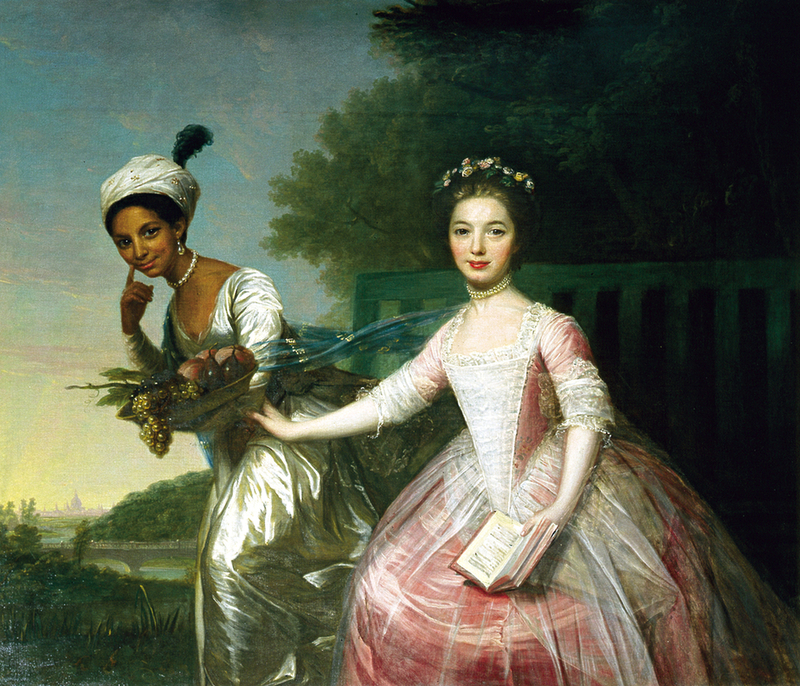 It might have the stuffiness of a period film, but with a powerful performance by Gugu Mbatha-Raw, Dido Elizabeth Belle's story has an actress worthy of carrying her story.